An extremely versatile effect on an extremely slim budget. Versatile. Small footprint. Classic phase tones. "The manual claims 'it pours on the special sauce to take your tone into outer space'"
Firstly, the manual claims 'it pours on the special sauce to take your tone into outer space', and secondly, it takes an 18-volt power supply. 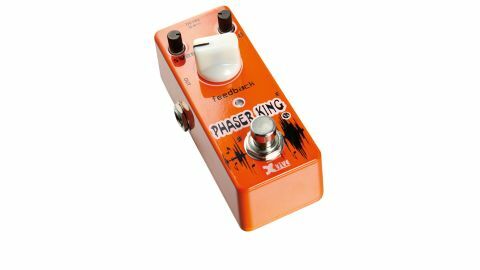 It's worth persevering with the power quirks, though, because the tone recalls the thick, chewy sweeps of classic 10-stage phasers, such as the MXR Phase 100 and Boss PH-2. There's a huge speed range, too, from super-slow take-off-style sounds to vibrato-ish wobble, while the feedback knob adds extra throb for more vocal sounds.